I love all the Favor Boxes that Taylor has in her store! 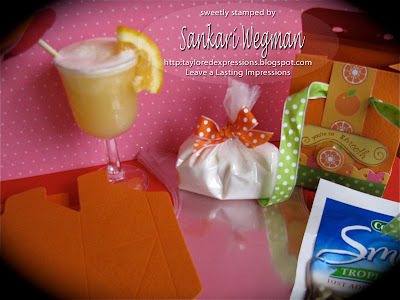 I love having a few of each handy - because you can create a sweet packaged treat in a snap! I used the scalloped lid box (and you can pick out of a zillion different color choices too!!!) 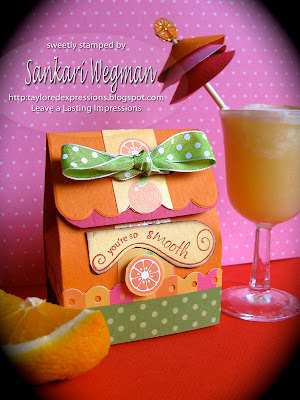 and created this little favor box from a smoothie mix - using the sentiment from the newest stamp set called: You're so smooth! This was such a quick and easy way to make some fun party favors for the birthday party - and you can decorate it in a snap! Please check out the Taylored Expressions store for all the variety of favor boxes and Perfect Packages!!!! Trust me - these are fantastic for creating something special in a snap!!! Also you can sign up for the newsletter for all the happenings from the Taylored Expressions store right on the right side of the blog! And make sure you check out Taylor's blog tomorrow and the store for the details on the newest release!!! Hope you are having a smoooooth day! This is adorable!!! What a fun little package...oh, you could use it to 'smooth' things over after an argument! LOL! How cute is that?!?! LOVE it! Your work is just amazing!